On my drive down I-25 to work this morning, I saw something you don’t regularly see on the plains, a bull and cow moose galloping alongside the interstate. Today is the summer solstice (the apex of sunlight during the year), and I knew something was special as I prepared iced tea and a game of Bocce Ball for our solstice party at the company where I work – Solstice Arts. As I was pulling off at the Johnstown exit near Johnson’s Corner, I noticed two dark figures frolicking in the green field alongside our corporate headquarters. Upon closer inspection, I found that they were moose and snapped a couple pictures. This seemingly chance encounter was perhaps fortuitous, as we recently introduced a painting to www.personal-prints.com titled “Moose Tracks” by internationally collected Colorado artist Scott Kennedy. Since moose are not commonly found at this low elevation, Johnstown police were on the scene shortly thereafter to make sure people did not disturb the massive animals. 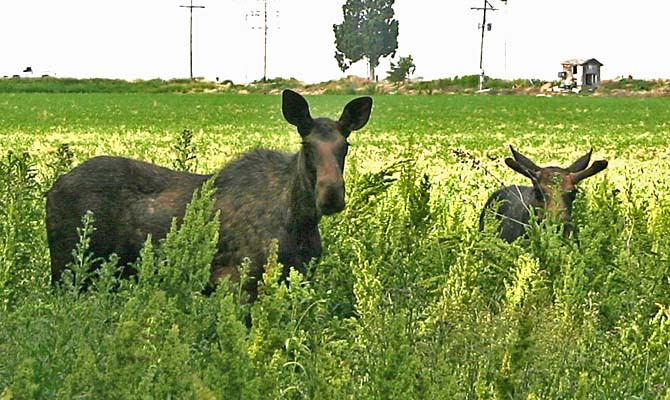 During the summer months, moose occasionally venture away from their mountain homes and wander along river beds to find food at lower elevations. This time of year, the bulls are growing their antlers. If you look closely at the picture, you can see the velvety antlers beginning to take shape on the young moose’s crown.